During the five-week partial government shutdown, Juneau food pantries served more people than usual and distributed thousands of pounds of food. At least two schools in Juneau are holding drives to replenish the stocks. Maraiya Savland, office assistant at Mendenhall River Community School, said at first they focused on ways to directly support students at the elementary school whose parents work for the federal government. “But then we also knew that the food bank was opening up to help those families as well,” she said. And they recognized that people in Juneau still need help, even with a short-term funding deal in place through Feb. 15. 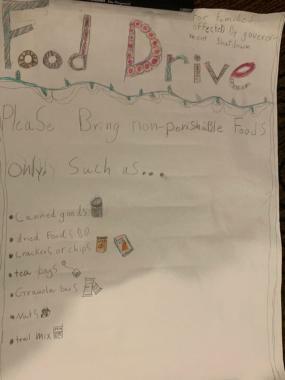 So on Monday — the first day many furloughed employees went back to work — they started a food drive, with collection boxes in front of every classroom and one in the front office. At the end of the week, everything will be donated to the Southeast Alaska Food Bank at the end of the week. Savland said anyone from the community is welcome to stop by the school’s front office with food donations. A similar drive is also taking place at Montessori Borealis. Darren Adams is the manager of the food bank. He saw a greater demand for the food bank’s services throughout the shutdown — but also for more help from the community. Adams has opened the food bank specifically to federal workers during special hours the last two weeks. He said about 100 people visited on the first afternoon, taking home around 2,800 pounds of food. Only about a dozen federal workers stopped by during special hours this week, but Adams said the need is still there. The food bank will continue opening to federal workers each Monday afternoon until a long-term funding deal is reached. The hours will be shared on the food bank’s Facebook page.